Also known as marguerite, moon daisy or, in the north of England, dog daisy, this is a plant of old unsprayed hay meadows or, more likely nowadays, of waysides and road verges. The leaves are variable; the lower ones usually rounded, the upper ones narrower and toothed, clasping the stem. The large daisy flowers are borne singly. The rays (petals) are white, and the central disc florets are yellow. 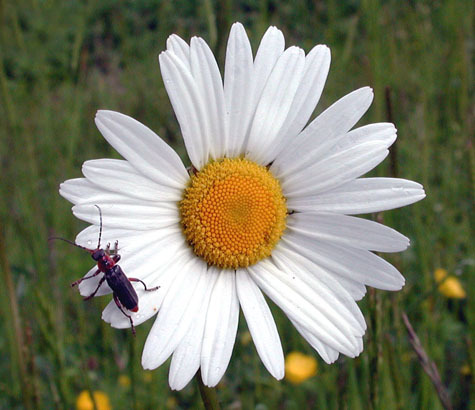 Ox-eye daisy is often included in wildflower sowings in meadows or along motorway verges. It has been used in salves and medicines for many diseases, such as chest and liver complaints and has been recommended as a cure for asthma and consumption, wounds and ulcers. From this plant have been developed many garden varieties of daisy, usually under the latin tag of leucantheum x superburn. These include double-flowered varieties, such as “Esther Read”. The story has it that a gardening enthusiast travelling on a slow local train back in the early part of the last century spotted a double flower growing on an embankment and on the return journey pulled the communication cord to stop the train in order to collect the plant. We are not told whether he had to pay the usual fine! Text: George Metcalfe. Photographs: Colin Wootton. This entry was posted on Saturday, July 31st, 2010 at 8:43 am	and is filed under News. You can follow any responses to this entry through the RSS 2.0 feed. You can leave a response, or trackback from your own site.